Falooda recipe by Rose at PakiRecipes.com. 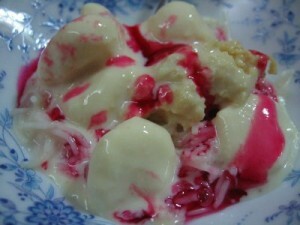 A popular and traditional cold dessert or beverage made by mixing rose syrup with vermicelli along with Ice cream. Take a pot and put oil and choti lache in it. Then, take the packet of Sipa, and put only half of the cut vermicelli in the pot. When the vermicelli starts to become a light brownish color, put in the milk. When the milk starts 2 boil, u may then add the sugar. When the saviyaa, or vermicelli , become thick, put it in the freezer 2 cool. When you are about to serve, put the ice cream on top, and add some rooh hafza on top as well. The oil is used to fry Vermicelli. It will not at all be floating over the falooda. oil in faluda ... wat the hell.